Col. J.R. Ellinwood, chief engineer and surveyor for the Santa Fe Railroad, petitioned for the Ellinwood townsite in 1872. With the arrival of the A.T. & S.F. Railroad, Ellinwood became a fast growing community of mostly descendants of southern German/Austrians. These hard-working people built two cities; one, of intriguing interest, is underground. The tunnels of Ellinwood at one time ran through the entire business district. Today a portion of those tunnels are open for public viewing. Located on the Santa Fe Trail, the town was a social and cultural center of the 1890's. Large flour mills and the county's only brewery, a highly successful operation until prohibition in the 1890s, put the town on the map and at the tip of the tongue. It flourished with a building and business boom. German heritage is shown by the architecture of Main Street buildings and the underground shops of yesteryear. Structures date from the late 1800's. The brick streets are carefully maintained. Citizens enjoy a golf course, swimming pool, archery range, soft and hard ball fields, tennis courts, a track and Wolf Pond for fishing. Ellinwood lies between two large natural wetlands excellent for bird watching, hunting and fishing. Quivira National Wildlife Refuge is ten miles to the south. It?s 21 miles of canals divert water to 34 wetlands from 10 to 1,500 acres in size. Its area contains the Big and Little Salt Marshes that were market hunting and hunt club locations over a century ago. There are nature trails, an auto tour, photography blinds and a visitor center. Cheyenne Bottoms is about 12 miles north of Ellinwood. It has 41,000 acres in a natural basin 90 feet lower than the Arkansas River. Of this, approximately 20,000 acres is a wildlife management area administered by the Kansas Department of Wildlife and Parks. Over 300 different bird species have been viewed there to include the whooping crane and bald eagle. Also a hunting and fishing area, it was originally a Cheyenne Indian hunting ground. 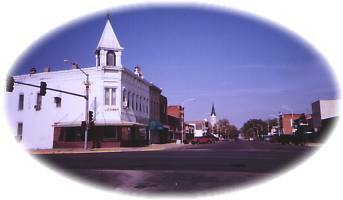 Ellinwood, a community of 2300, provides the warm active community of a small town. We hope you'll enjoy Ellinwood as much as many of us who have spent our lives here. Wherever you've come from---Welcome! Wolf Pond is a popular fishing spot, and one of several parks and playgrounds in Ellinwood.